James A. 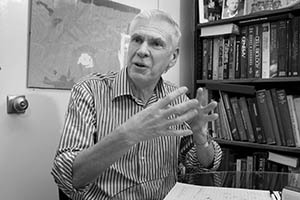 Lake, Distinguished Professor of MCD Biology UCLA, Fellow of the Linnean Society of London, American Academy of Arts and Sciences, American Association for the Advancement of Science, and the American Microbiology Society Professor James Lake is best known for the New Animal Phylogeny for which he received the Darwin Wallace Medal in 2011. He is also well known for the Eocyte/Two-Domain Tree of Life that has recently been proven and extended in the labs of Martin Embley, James McInerney, and others. After a Ph.D. in Physics (University of Wisconsin), postdocs at MIT and Harvard, Jim was recruited to Rockefeller U. by Nobel Laureates George Palade and to UCLA by Nobel Laureate Paul Boyer. In the 1980s with the advent of DNA/RNA sequencing, Jim was inspired and mentored by Allan Wilson and became intrigued with evolution. Jim and Allan were close friends, in the late 1980s their families holidayed on Monterey Bay, played tennis and talked evolution and scientific politics. Jim invited Alan to give his first presentation on "Eve" at UCLA, where Allan received a standing ovation. They were both founding members of the Sloan Foundation's Molecular Evolution Advisory Board and were in frequent phone contact until Allan's death in 1991.